The world speeds up as earth prepares for cataclysmic change. Are the increasing climatic storms a portent of the end of the world or a new beginning. 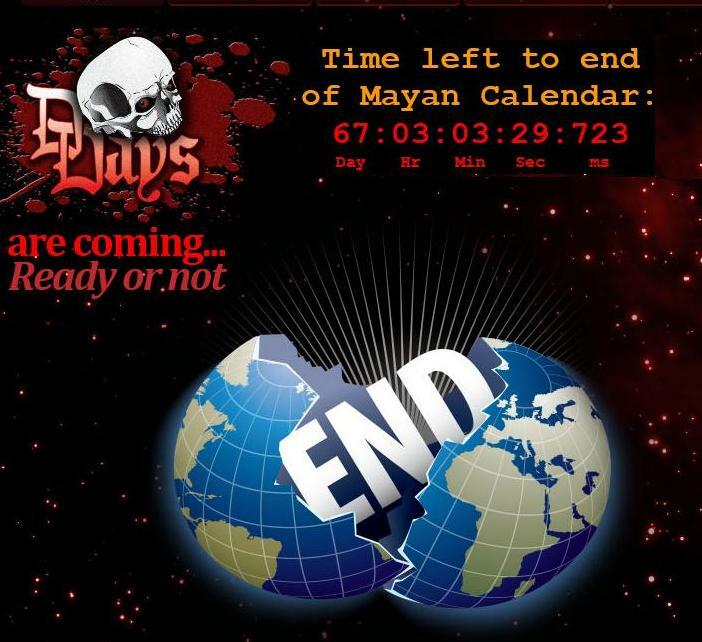 The Mayan calendar is the next prediction of doomsday and we will soon find out if its the end. Copyright 2012. All Media Rights Reserved. Hurricane Sandy touches down on the east coast causing massive flooding and devastation and many question whether this is the tip of the proverbial iceberg. Public transit systems are paralyzed in New York, Washington and Philadelphia as trains and planes are halted because of Hurricane Sandy and the logical question is what's coming next. December 21, 2012 is now circled as the next date prognostic of the end of times. Based on the end of the Mayan Calendar much debate has occurred to verify or debunk the coming purported "Galactic Alignment" event. The truth will soon be apparent. Will our planet fly off its axis rendering us lifeless or will we continue on our cosmic journey. Has Sandy lit the fuse. Is Earth about to undergo a polar reversal. Or fly off its axis? Once this date comes and goes, do we simply forget about it, or use Sandy as example and an opportunity to proactively decide our future here together- as enlightened souls rather than the continuation of our own egoistic, selfish behaviors. There are many other ultimate extinction events that face our world such as climatic changes caused by a Runaway Greenhouse Effect. End of Earth App lists its top twenty predicted events from a multi disciplinary panel including a renowned scientist, futurist and researcher. Data was obtained from historical research and ancient prophesy. There is substantial evidence of numerous past Armageddon, mass extinction events that have ended the then dominant life forms existence on Earth throughout the past 500 million years. These findings have been verified through independent scientific analysis establishing among other things, massive impact events, climatic changes (deep freeze) as well as atmospheric changes resulting in evolutionary destruction. These extinction events have led to humans being the current ruling intelligent species. As science rapidly evolves providing more tools to analyze our worlds past, and opportunities to better understand our future, these same discoveries if negligently handled or intentionally misused may increase the likelihood of the end of all life. While our predecessors were merely exposed to natural mass disasters both terrestrial (ice age) and extra terrestrial (massive object impact), the human species now must also deal with the new threat of facing planetary demise by its own hands -through human created actions. Bioterrorism, nuclear holocaust man made virus or bacterium are just a few areas that raises the inherent dangers posed to our species and other living beings. We therefore need to raise our level of consciousness rapidly and learn from our predecessors experiences. Otherwise we may be doomed to repeat the same ultimate end. consciousness, the inherent danger posed is lessened. Working cooperatively together, as World Citizens, we can vanish the imminent danger of mass extinction. Together we can create a new planetary community that shares a broader, more selfless approach. Using scientific and spiritual research there appears a date in the future that consistently appears to converge and whether it is predictive of a future cosmic divide and cataclysmic event or a period of enlightenment, is based on ones perspective of the role of free will or fate. If this date is real we have six years to change our direction as a group and exercise our choice to manifest a new future together. This finding revealed in an upcoming App is based on the idea that firstly nothing is random in the universe and secondly that our thoughts and action are energy driven and manifest our physical reality. When the possible Armageddon may occur is based on a date that appears over and over in ecclesiastic and scientific/ mathematical analysis. The finding is of a recurring date of 5778 CE which converts to English calendar 2018. It could mean we are rapidly approaching the end of days. We can use this time for a new cosmic conscience or if we don't work collectively we will find out that our physical time on the planet will end. Our daily actions impact the world we live in and many believe we are already living in the dead days as the world rapidly evolves and speeds up with potentially dire outcomes. It is imperative that our own consciousness rises to a level of sharing that understands the importance of treating our neighbor as if (s)he is ourselves. Is Armageddon around the corner? Are the End of Days upon us? The end of the world date is a topic intriguing to human beings since the beginning of recorded time. The subject of a human mass extinction event has received heightened media coverage and this is likely to increase exponentially as we get closer to December 21, 2012. Many believe the Mayan Calendar ending on this date will result in a cataclysmic event that will throw earth off its axis and hurdle us into outer space. So are we as human beings doomed? Or is there hope. Armageddon or the Apocalypse is defined here as a mass extinction of the dominant species on earth (namely humans). The end, game over, finis, over and out. There is in fact, historical evidence of multiple other Apocalyptic events that have occurred throughout earth's multi-billion year old history that have resulted in the then dominant life form being extinguished. There have been five recorded massive impact events identified by science over the past 500 million years as well as drastic climatic change that resulted in the mass destruction of the dominant life forms on the planet? Governments and citizens around the world have taken notice of the apparent increased frequency in natural disasters and set out to proactively address this issue. Recently much news about the trend of global warming has focused on the change in temperature and melting polar icecaps. The rise in sea level is a major cause for concern. Known as the Runaway Green House Effect (RGHE) this could cause substantial changes in our climate, resulting in massive flooding, etc. as the temperature rises. Will the earths demise be caused by massive flooding due to the RGHE. Or maybe our undoing will be an Alien invasion from a super intelligent life form that needs our planet's resources or maybe a catastrophic health event caused by a pandemic virus or bacterium, natural or otherwise. Other Apocalyptic possibilities are raised by ancient prophesies from over two thousand years ago. A Dew of Resurrection or magnetic rain suggests the Dead will rise. Will that be our end. And if so when is the predicted Apocalypse date? When the End of our World arrives, will we be ready? We each have something to say about our future on this planet. Human beings from all walks of life, scientists to prophets to everyday ordinary people have debated the issue throughout time. We are transfixed by not only our own individual mortality but of our collective existence as the human race. A calculation of this end time is currently being undertaken using multi-discipline reference sources cross referenced in a new App, as the Mayan Calendar reaches its zero hour on December 21, 2012. Why, then should another proposed Armageddon date be taken seriously? Using research found in science, mathematics, prophesy and ancient text, each of these unrelated sources suggest another end date, predictive of a cosmic shift in the current world order. The End App will present its top twenty human extinction categories and a date prediction that threaten our world. Whether or not December 21, 2012 is the end, it is time for world citizens to take note of the ultimate threat to our species. The App will provide users a clear view of what others on the planet are saying, list proactive survival strategies and vote on the end of world dates and ranking the ultimate end causes. End App's purpose is to raise human consciousness for an event predicted to occur within the next ten years. However, the future is multi-variable, merely a set of probabilities based on individual and group thought and action. Our energy creates our future and manifests our reality here on earth. So everything in this world is created by our consciousness. As that consciousness shifts so does our future. So what will eventually be our fate. Will we become extinct like dinosaurs or will we rise above as a group conscious body to find immortality. Perhaps evolve to a higher more evolved life form? Movies and tv shows have spawned a culture of individuals seeking the answer to this vexing question and we decided to deliver our findings through an App that will connect us all. And then deliver a fictional story about the end of days based on our research. Armageddon countdown will soon begin and what will either be our own undoing or ultimate triumph will be based on the hypothesis that we are all connected, we manifest our reality and nothing is random in the universe. The Dead Days is coming...Ready or Not.